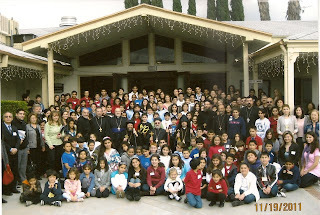 The Oriental Orthodox Churches (Syriac, Coptic, and Armenian) held their annual Sunday School event on Saturday, November 19th at St Ephraim Syriac Orthodox Cathedral, Burbank, CA. "Bible Adventure Day" was the name of this year's event and the theme was children. The event was presided by His Grace Bishop Serapion, His Eminence Archbishop Mor Clemis Eugene Kaplan, and His Eminence Archbishop Moushegh Mardirossian. With 160 children ages 8 - 13 participating, 10 priests, 20 youth team leaders, 20 moderators (judges) and about 50 parents. Thirteen churches participated in the event from the local Los Angeles area. The day began with a Liturgy celebrated by all three Eminences. Hymns were chanted in each of the respective languages, and each Bishop presented a sermon which focused on the theme of the event - the importance of the Sunday School Program and being always involved in church. Three students - Gayane Yegoyan, David Kneiber, and Stephanie Hanno -- each presented a speech about the importance of the Bible Adventure event, and being with fellow Orthodox students. The Liturgy concluded with the Prelates giving Holy Communion to all. A group photo was then taken outside, followed by lunch for everyone. Youth Team leaders then gathered with their students and prepared for the beginning of the Competition portion. The students were divided into 2 age groups -- ages 8 to 10 and 11-13. The teams were mixed members from the Armenian, Coptic, and Syriac churches. Teams competed in 3 areas - poster presentation, skit presentation, and puzzles station. Each testing area allowed teams to select one of 13 biblical verses and complete a task according to that station's rules. Teams were very creative and everyone worked together to draw/design and complete what they had to do. It was very fun and amazing to see how students from different churches worked together, and most importantly they were united through our Lord Jesus Christ. While teams were not competing Rev. Fr. Muron (Armenian Church) and Rev. Fr. David (Coptic Church) held a Question and Answer Discussion Forum in the main church. The two priests did a wonderful job answering student questions about priesthood, clergy vestments, Liturgy, and saints. Students really enjoyed their time with Rev. Fr. Muron and Rev. Fr. David, and we extend our gratitude to the both of them. At the conclusion of the event the two winning teams from each age division were announced -- Team St. Jacob (ages 8-10) and Team St. George (ages 11-13). Congratulations to both teams for their great effort and teamwork!! All students were presented a Group picture, sports bottle with the OOC logo, and a Bookmark. We thank God for another successful OOC Sunday School event and look forward to the 2012 gathering.